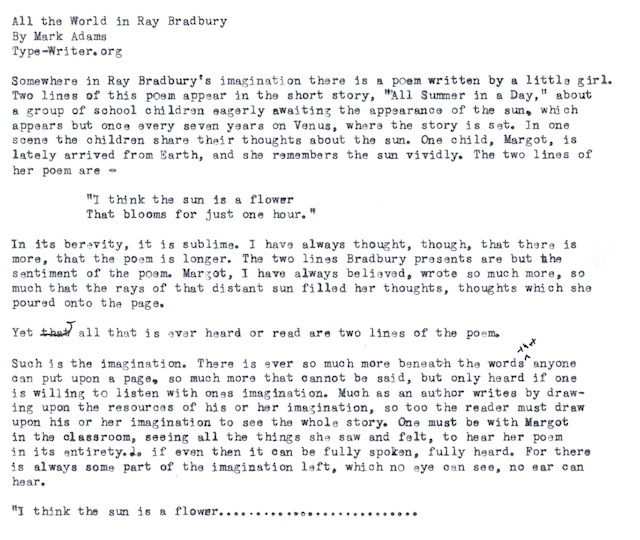 I don’t think I’ve read that Bradbury story, but it sounds like classic Bradbury. I get a feeling of the atmosphere just from your description and those two lines of the poem. I can’t remember in which collection this short story is found, but it is available online: http://www.wssb.org/content/classrooms/tate/content/freshman/all%20summer%20in%20a%20day/story.htm. There is a stark contrast between the beauty of the poem and the later actions of the children. Next post: Fay Sho No. 7? Or No. 6?